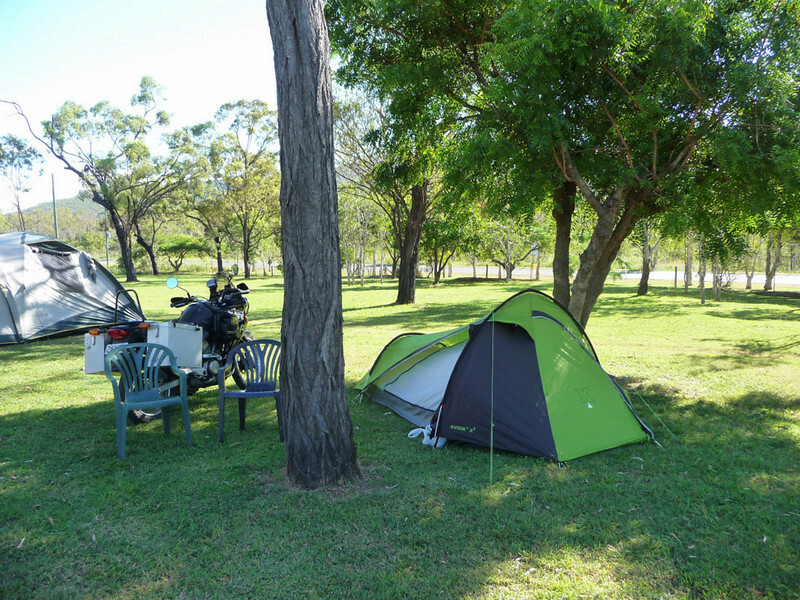 I spent two nights at the peaceful and picturesque seaside city of Hervey Bay, largely because I was starting to fall behind with my blog entries and wanted to catch up. Secondly, my accommodation there was comparatively cheap, although I had to forfeit many of the luxuries and conveniences of a hotel/motel. A case of 'you get what you pay for' when you stop at a hostel such as the Colonial Village YHA. Besides, I had a little spare time on my hands. 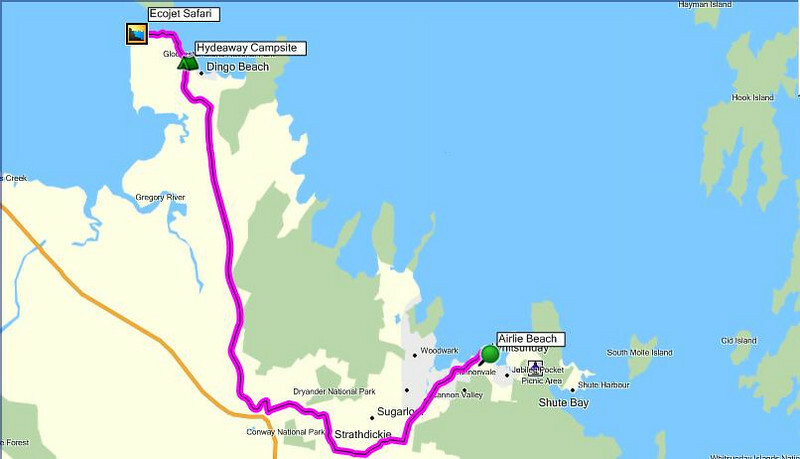 My only near term deadline occurs the following Monday afternoon, 18th April – 5½ days' time – when Ellen's in Mackay QLD .. some 740 km [460 mi] – an easy 2-days' ride – up the Bruce Highway from Hervey Bay. It's Melanie's (my daughter's) birthday today; I'll phone her Saturday morning though - the day after - thus ensuring we can talk during the early evening-time of her birthday, from her point of view. Note that England, now on British Summer Time, is running nine hours behind Australian EST (Eastern Standard Time). Friday morning: On the road again .. to the Town of 1770. Yes, that's right, there is a settlement here in Oz that's named '1770' - alternatively denoted with letters, e.g. 'Seventeen Seventy'. Originally known as 'Round Hill' — after the creek it sits on — the name was changed in 1970 to commemorate the bicentennial of Captain Cook's historic landing in 1770. 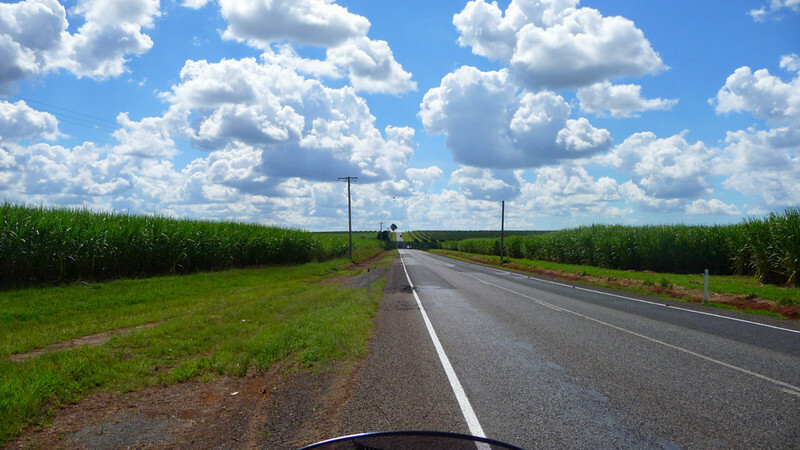 Away from Hervey Bay - the aussie wheat fields are now long gone .. and I find that I'm riding through endless acres of Sugar Cane plantations instead. 1770's neighbouring town of Agnes Waters serves as my base for the night - a sleepy little village with a great tavern (and drive-in bottle shop) at the top of the hill overlooking the settlement. 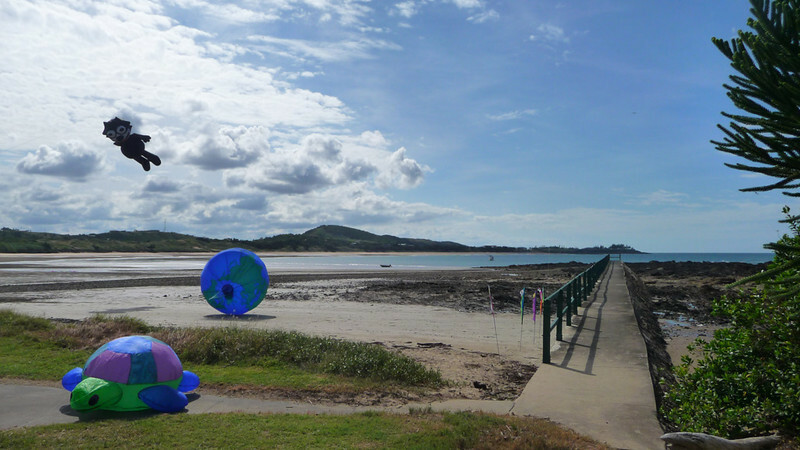 Both places are idyllic locations for a family-orientated beach holiday. Agnes Waters .. reminiscent for me of the small town of Saint Agnes, back home in Cornwall. I wonder if the townsfolk here nickname it "Aggie" (like St Agnes folk do)? I would be surprised if they didn't, as aussies seem to like abbreviating place names in this way. Towards sunset (occurs 17:40 EST) I made the short ride of about 7 km [4½ mi] to 1770 .. and then strolled out to the headland, through bush teeming with wildlife. 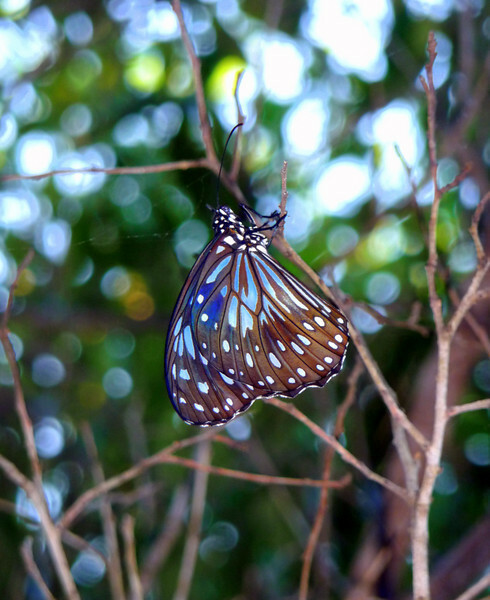 Some species of butterflies as big as small birds. 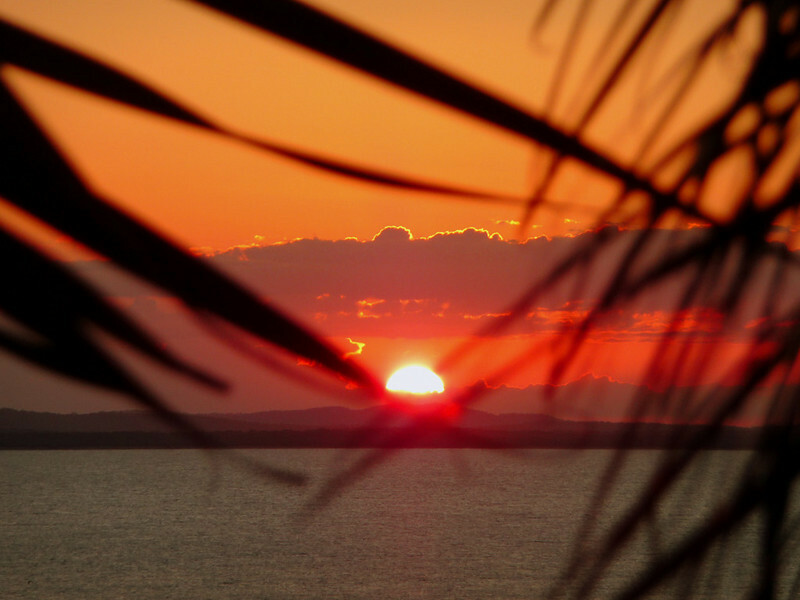 The time was precisely 17:37 when I snapped this picture, looking westwards through the bush palm on 1770's headland. Incidentally, I get my intel on worldwide Sunrise and Sunset Times from this website. I successfully called Melanie's landline at 05:49am (20:49 BST, Friday-15th); it was good talking to her again, especially on her birthday. Away from the hotel at 09:15am - and back on the road. 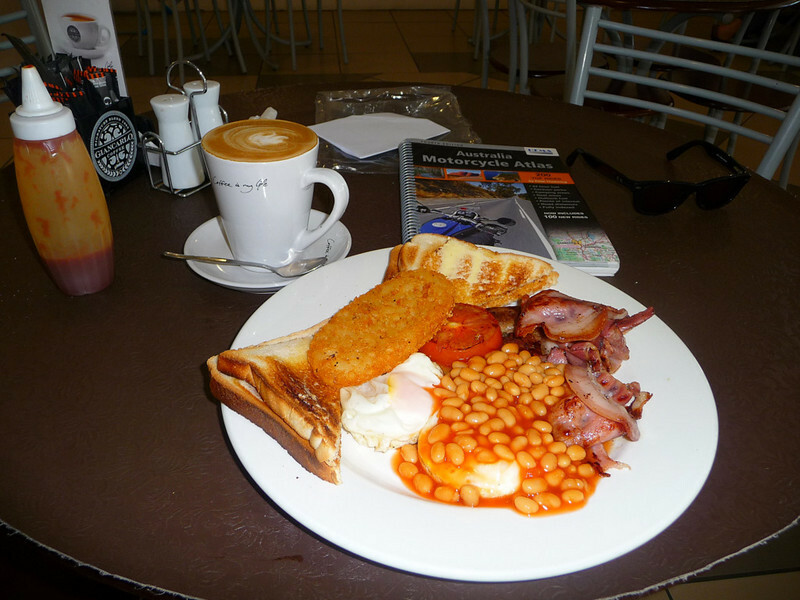 I picked-up the Bruce Highway again at Miriam Vale ..
.. where I stopped and enjoyed an 'all in' cooked brekky that was slightly different, but every bit as good (in its own way) as the one I had served-up down in Noosa Heads, but at AU$13 - including a whopping great mug of double-shot flat white coffee - it worked out at only 40% of the cost of the Noosa one. I was the whopping mug down in Noosa, of course! 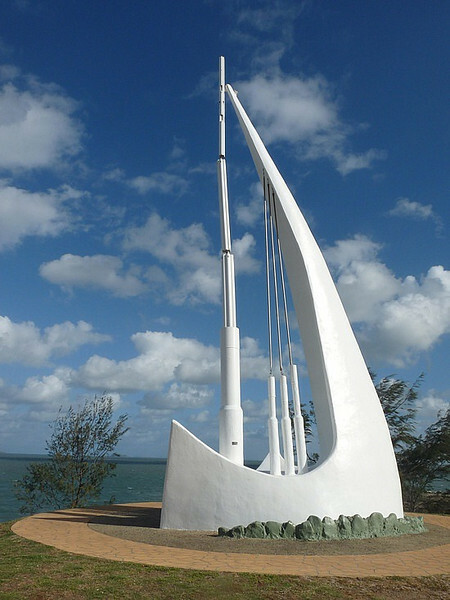 I would have passed through the Tropic of Capricorn (represented on maps as a "dotted line" that lies at 23° 26' 22") just south of Rockhampton. I looked out for some sort of roadside landmark of its location, but couldn't see one. I later learned that a monument originally marking the latitude was later moved into town to be more accessible to tourists. A lost photo opportunity for me then! I left the Bruce Highway and turned right at 'Rocky' for the Keppel Bay on the Capricorn Coastline .. and stopped for a stretch at the little seaside township of Emu Park (population c. 3,000). But there's not an emu in sight. 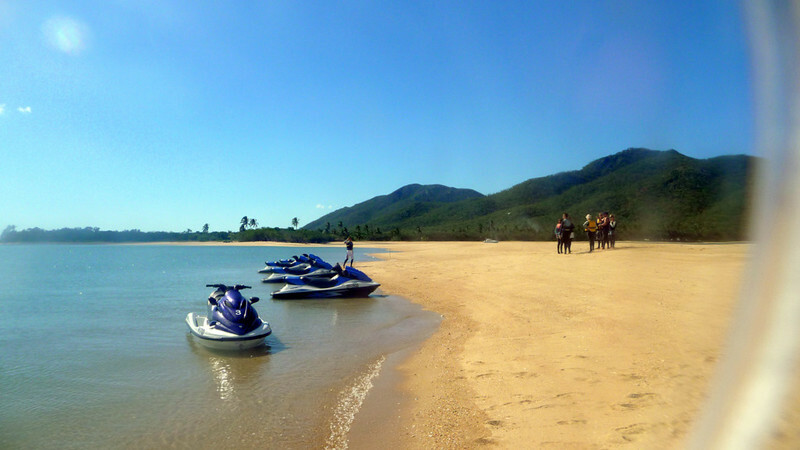 Long stretches of beaches are the main tourist attraction here, while the islands of the Keppel Group (on the horizon), in particular Great Keppel Island, are another drawcard. 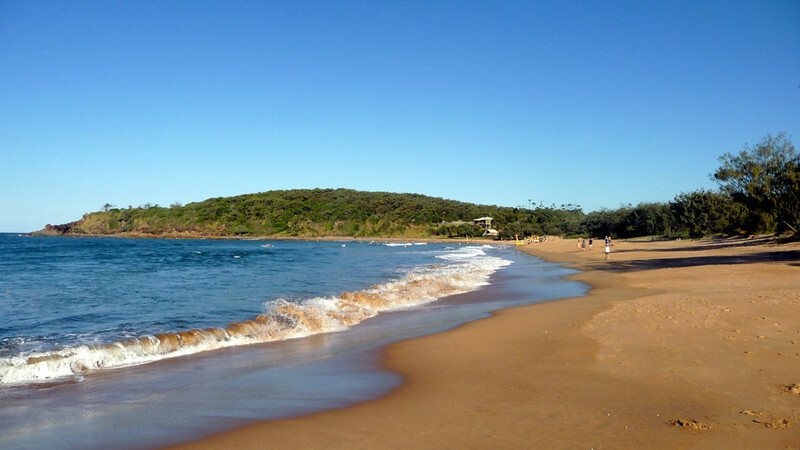 Fisherman's Beach, Emu Park - where this small pier was opened in 1924. But it's not a ship and it doesn't sing! 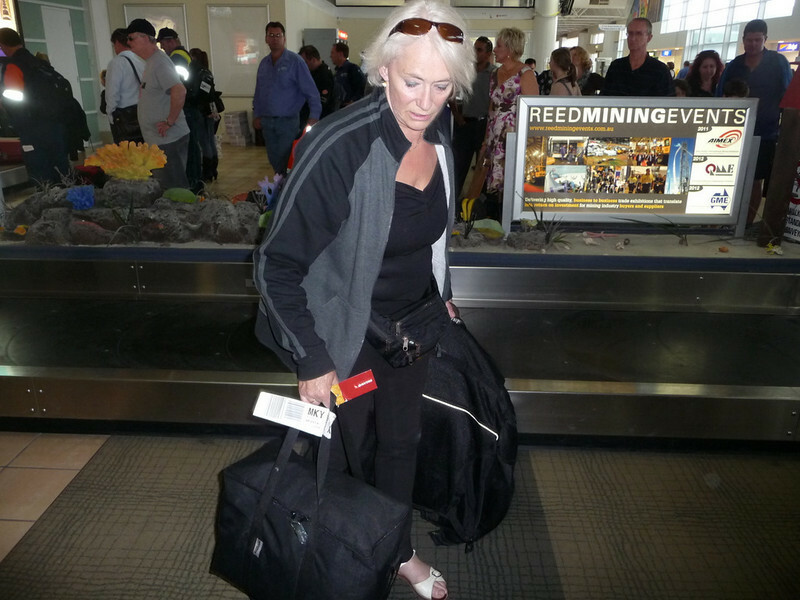 Gone for 26 days, during which time Ellen has flown halfway around the world twice; the first occasion under some considerable emotional stress. 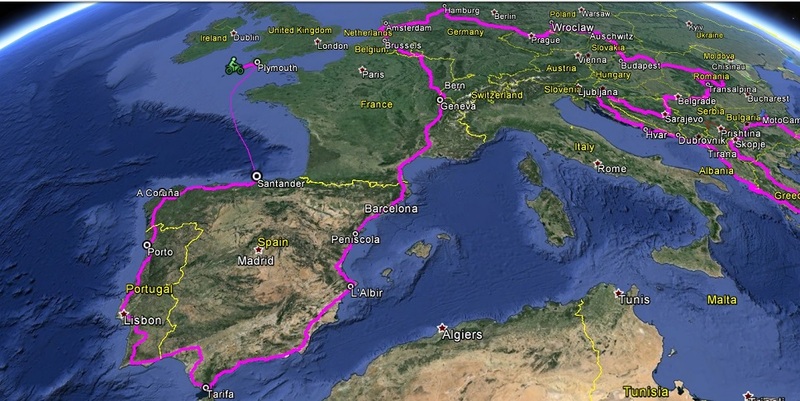 In addition, over that timeframe, she has travelled hundreds and hundreds (probably well up into a four figured amount) of miles around England by both train and by car. She's dealt with the funeral of her dear mother (her best friend); organised the family house clearance, cleaned through and decorated the downstairs section. Then put the house on the market (for sale). As an executor of the will, she has also had to attend to all the legalities associated with her mum's estate. 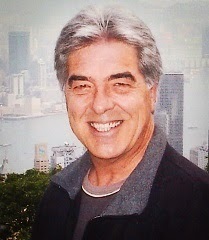 Then afterwards return down to Cornwall .. then get up to London Heathrow to catch her long-haul flight back to Oz. All in less time than it takes the moon to orbit the Earth, once. And now she's back in Australia again .. via Singapore ~~> Brisbane ~~> Mackay. 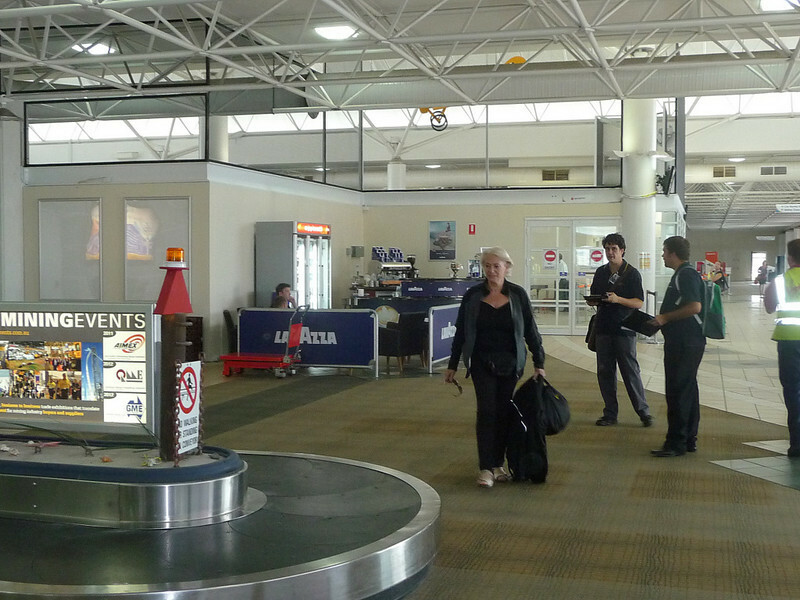 After thinking that my pillion should pretty much be beaten up by now, after 42 hours of non-stop travel; she instead arrives in Mackay Airport, Queensland full of energy .. and is smiling all over. I thank who or whatever gives a person like my passenger the spirit and zest to live life the way she does. Witnessing her approach to the difficult and sometimes painful issues that we all have to face from time-to-time, improves my own personal outlook on life - so I will continue to take it on-board. If this precious life we have, and all the 'stuff' that goes with it, was a motorcycling contest … I have a feeling Ellen would easily outride me! Now it's back to business, as usual .. together, with just four weeks to go, down under. I had planned on riding up into the inland ranges - and up around the ecologically diverse Eungella National Park in particular - but as Ellen was understandably tired and travel-weary .. and because there were some fairly nasty-looking dark clouds and mist shrouding the range summits, we decided to make a bee-line for Airlie Beach; gateway to the 74 islands that comprises the Whitsundays and the Great Barrier Reef beyond. 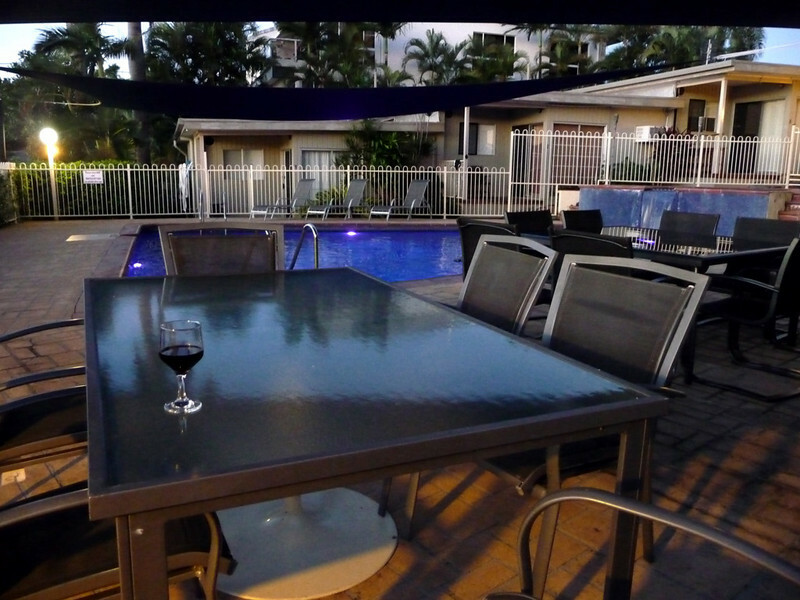 With the up-and-coming busy Easter Holiday period in mind, I had already pre-booked a 3-night stopover in a self-contained flat with Airlie Apartments. Notwithstanding Ellen's recent enforced hectic schedule, I think we're both do with some 'down time' .. and a complete break from travelling. 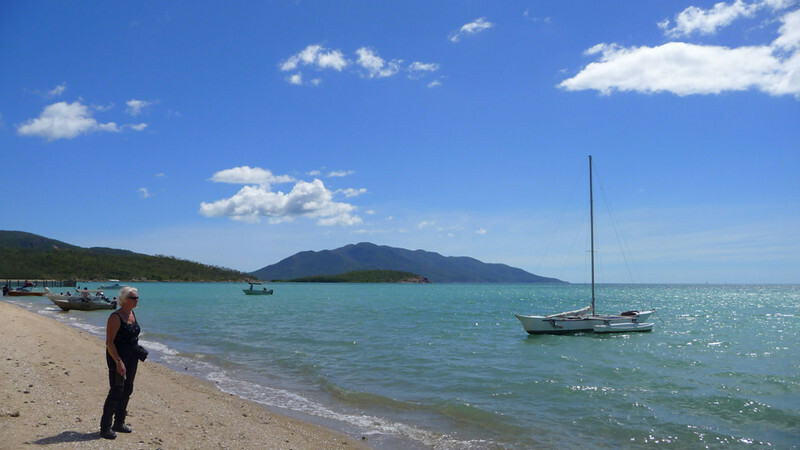 Quite a bit of development has occurred in and around Airlie Beach since my last week-long visit that took place exactly 17 years ago (April 1994). The town was still quite sleepy back in those days; now it abounds with tourists .. and especially backpackers. The local authority has built this Lido (they call it 'The Lagoon') in the middle of the town, which was opened in 2002. All and sundry go there to swim, sunbathe ..
and just generally 'hang out'. 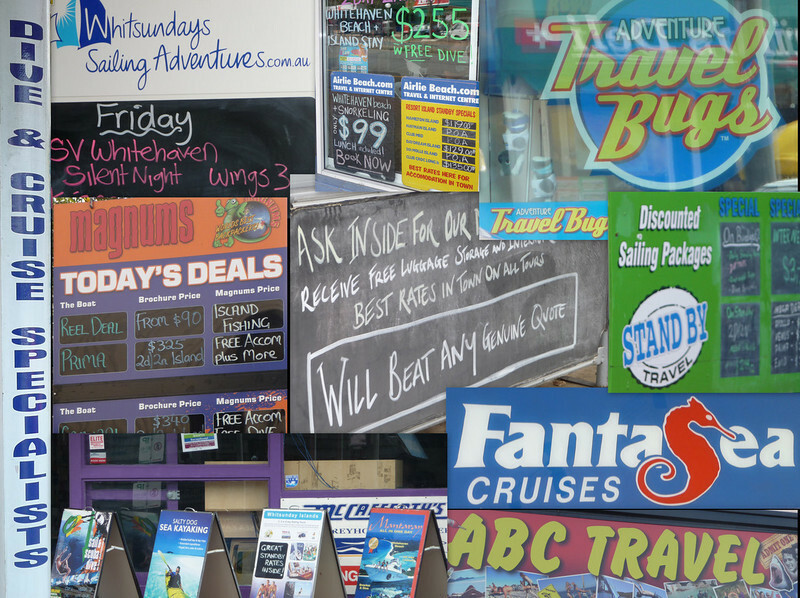 With basically only one main street, apart from eat, there's really not much to do in Airlie unless you're prepared to spend money on one of the Reef pontoon trips and/or the island sailing tours, which I know are more-often-than-not quite wonderful .. but expensive. And my word, there is fierce competition from the tour operators - and their multitudinous high and low street agents - for your business. We just didn't want to take part. 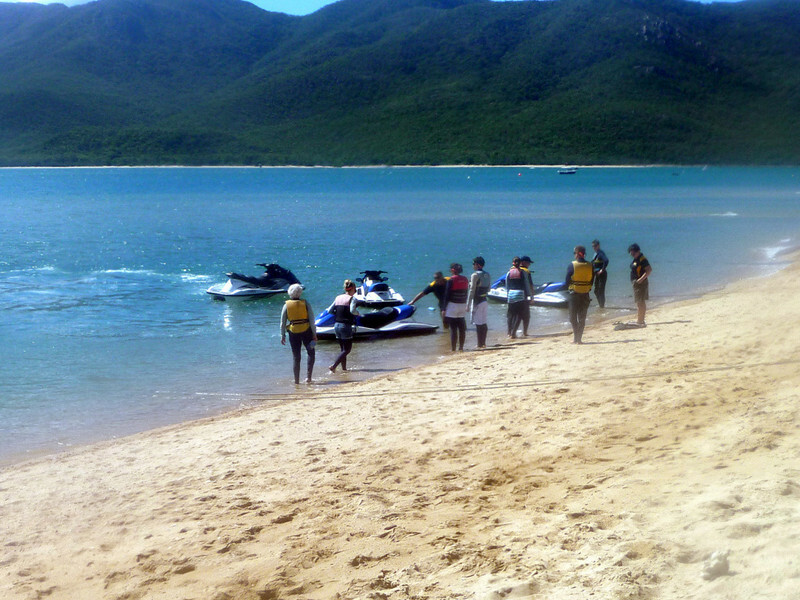 We weren't looking for a Whitsunday's 'formula' holiday. 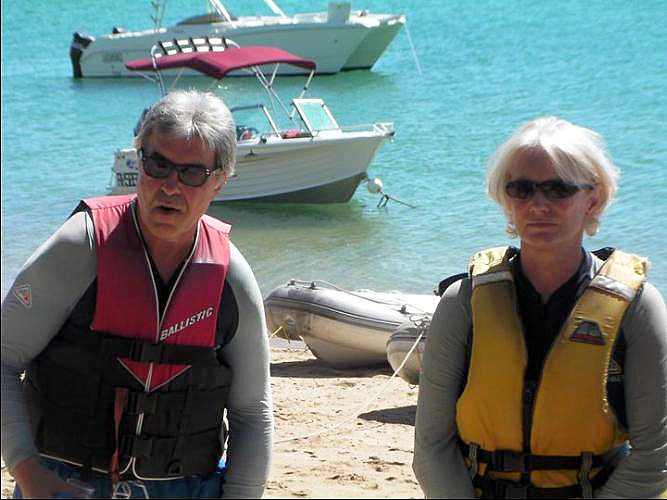 I had 'done' the Reef and sailing island tours back in '94 in any case .. and Ellen seemed indifferent to the idea. All we really wanted was (a) some poolside peace and quiet; with (b) the odd sip of grog and (c) tasty barbecued tucker. I'm pleased to say that we enjoyed plenty of all three at our nicely appointed apartment. 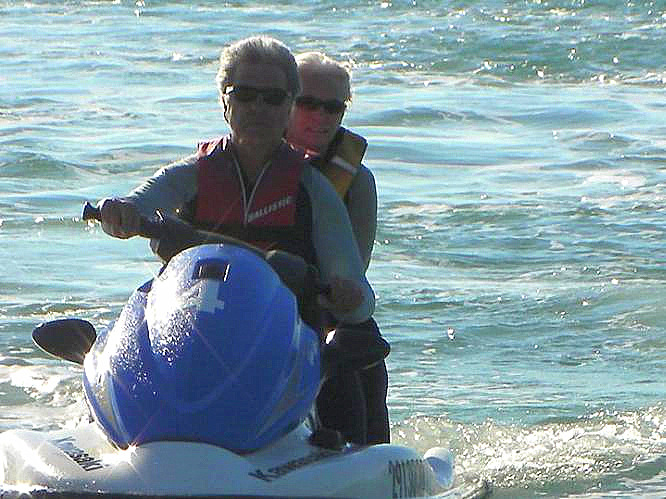 On Wednesday-20th we scooted northbound on a reconnaissance mission to inspect what else the area had to offer. After around 60 km [37 mi] we ended up at Hydeaway Bay. When the asphalt ran out we carried on. 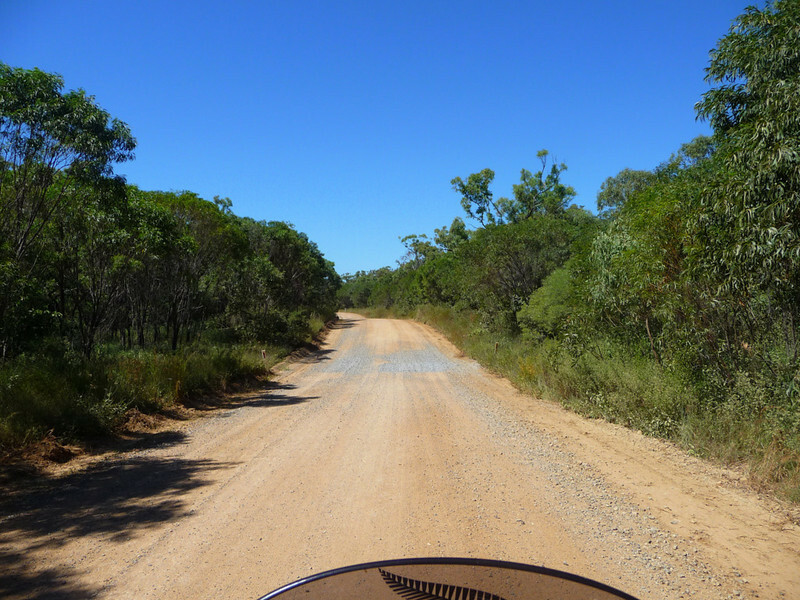 A bit of dirt riding [of approx 2-3 km] into the bush, eventually brought us to idyllic and comparatively quiet and uncrowded Gloucester Point ..
.. nice find! 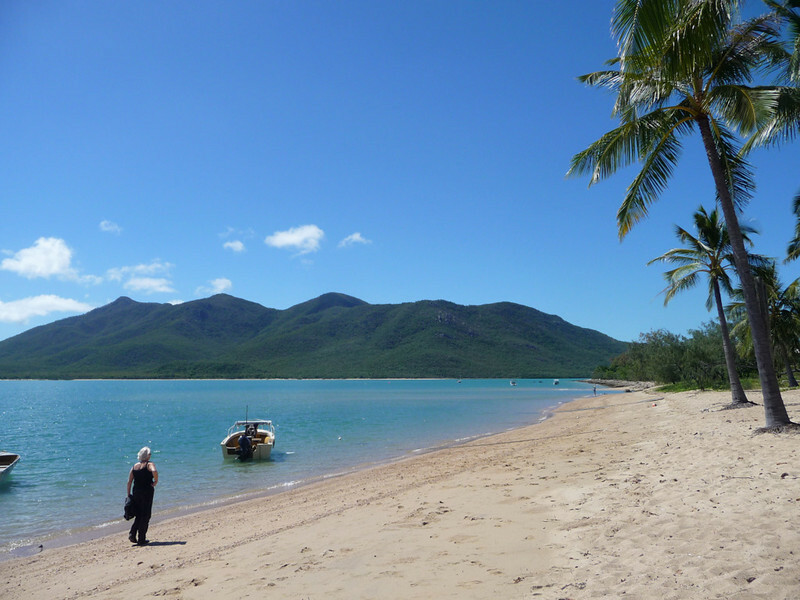 This is where we'll head for when our 3-day R&R stopover at Airlie concludes on Friday morning (22nd). 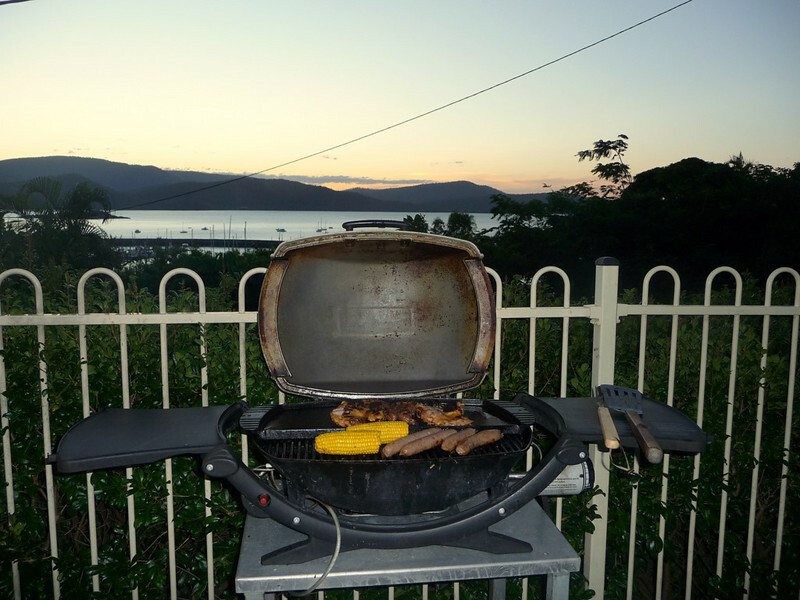 The weather is definitely settling down now .. and so it's time to break out the camping gear again, which has been gathering too much dust since last it was in used back in Newcastle NSW. 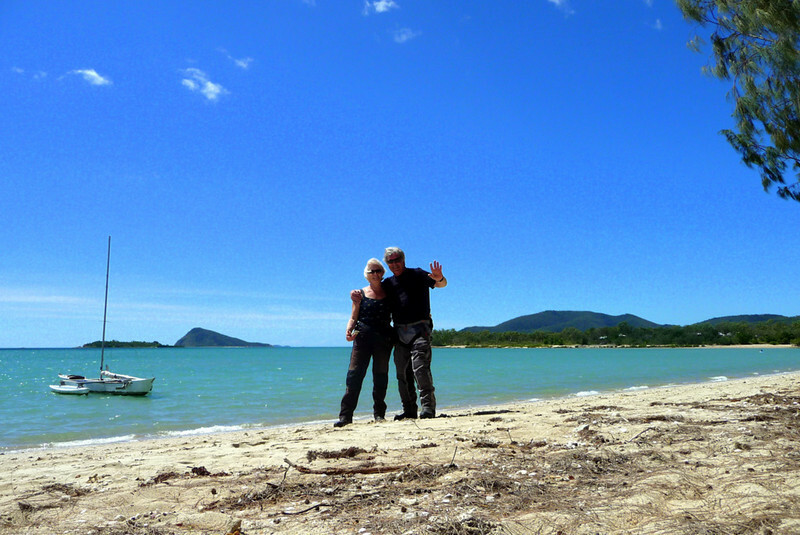 We exit Airlie – and then headed straight for Dingo Beach on Gloucester Point. A beautiful location .. BUT the local pub there was closed for the Good Friday Easter holiday. 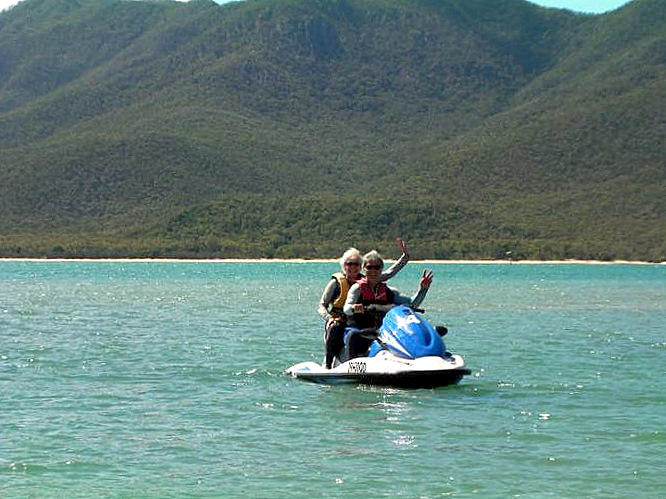 Gloucester Bay and the Gregory River is surely as good a place as anywhere to go on a jetski safari. Let's Go! 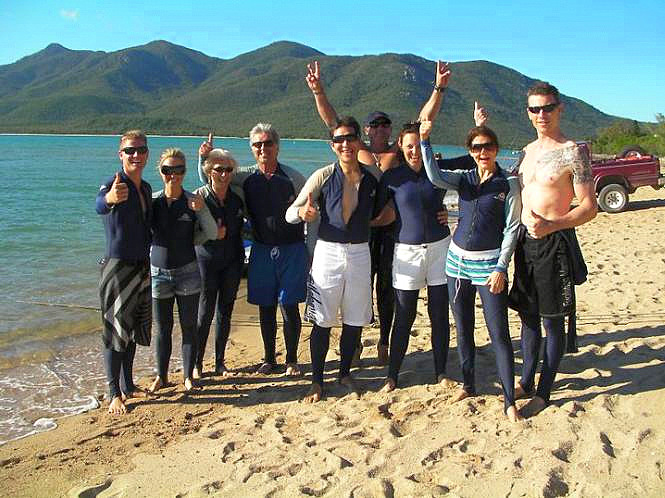 .. as we get our safety briefing - complete in our Lycra 'stinger' suits that provide a barrier between skin and some nasty marine life, like the notoriously dangerous stinging 'box' jellyfish. We get the operating instructions ..
We're all a bit nervous at first - until you get the hang of it. We only saw a little wildlife - but no crocs whatsoever .. :-( - but the fun on the trip was non-stop for three hours. We touched speeds of 80 km/h (50 mph). 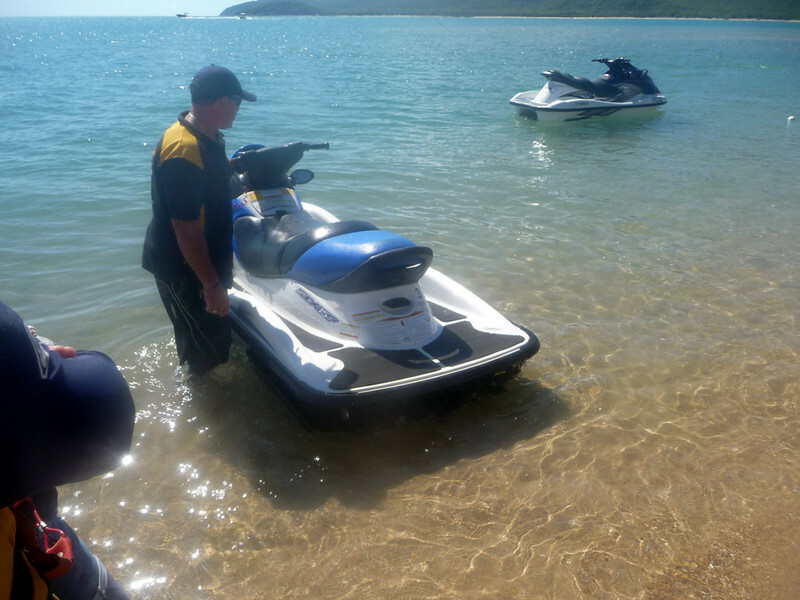 The acceleration capability of these machines is awesome .. it nearly pulls your arms out of their sockets if you open the throttle wide; the response from the four-stroke, 1,498cc (160 hp) engine is instantaneous. By the end of it all we were shattered. But it was a totally exhilarating experience. I would have liked to have added some video footage; but Ellen lost her own camera overboard whilst attempting some still photo shots due to the violent crashing and banging .. so I thought it best not to hand her my camera! Final group shot: and needless to say, Ellen's and my participation takes the average age of our little party of eight up from around 23 to 45'ish! 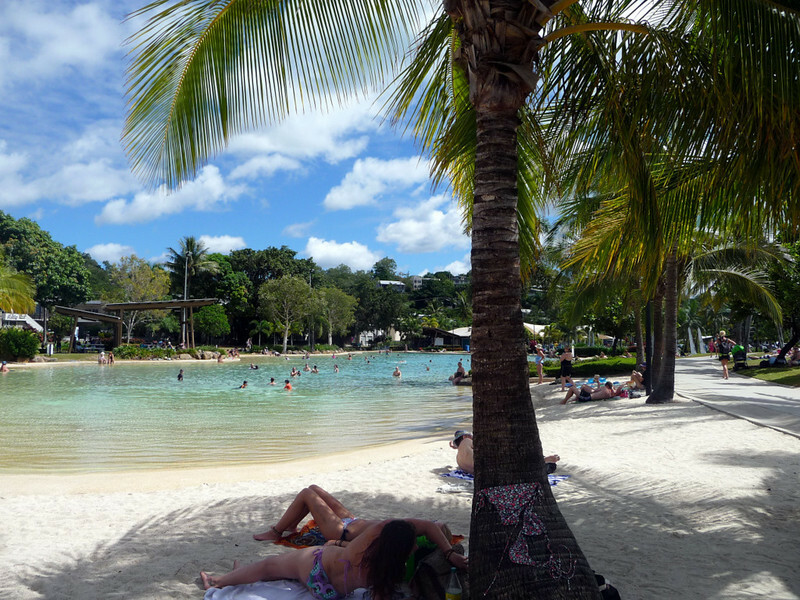 Summary: A great way to spend an afternoon in tropical northern Queensland. Breakfast at the Dingo Beach pub. 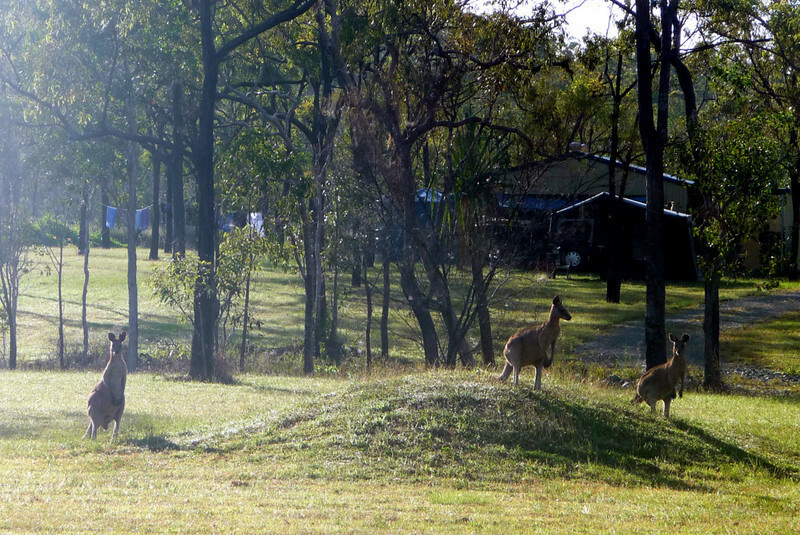 You know you're in another place and doing something different .. when on the way to the pub you see a troop of wild Big Red Kangaroos along the roadside at half past seven in the morning! Back at the campsite after a yummy cooked brekky. A couple of hours are spent working on the bike .. and then we're on our way to Townsville, Australia's largest tropical city, some 275 km [171 mi] to the north.